This Afternoon... A 20 percent chance of showers and thunderstorms. Mostly cloudy, with a high near 80. Southeast wind around 15 mph, with gusts as high as 25 mph. Tonight... A slight chance of showers and thunderstorms before 7pm, then a chance of showers and thunderstorms after 1am. Mostly cloudy, with a low around 67. Southeast wind 10 to 15 mph, with gusts as high as 20 mph. Chance of precipitation is 50%. New rainfall amounts of less than a tenth of an inch, except higher amounts possible in thunderstorms. Wednesday... Showers and thunderstorms. Some of the storms could be severe and produce heavy rainfall. High near 77. 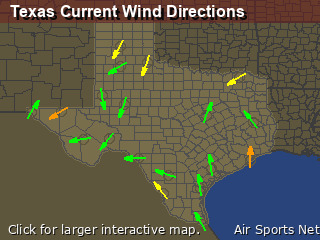 South southeast wind 10 to 15 mph, with gusts as high as 20 mph. Chance of precipitation is 80%. New rainfall amounts between a quarter and half of an inch possible. Wednesday Night... Showers and thunderstorms, mainly before 1am. Some of the storms could be severe and produce heavy rainfall. 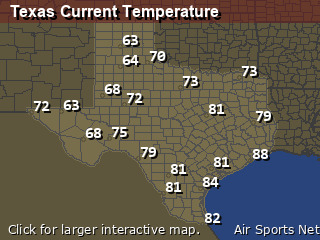 Low around 59. Southeast wind 5 to 10 mph becoming north northwest after midnight. Chance of precipitation is 90%. Thursday... Sunny, with a high near 81. Northwest wind 5 to 10 mph. Thursday Night... Mostly clear, with a low around 60. North wind 5 to 10 mph. Friday... Sunny, with a high near 82. East northeast wind 5 to 10 mph. Friday Night... Clear, with a low around 59. East northeast wind around 5 mph becoming south southeast after midnight. Saturday... Sunny, with a high near 85. South wind 5 to 10 mph. Saturday Night... Clear, with a low around 61. Sunday Night... Partly cloudy, with a low around 65. Monday... Partly sunny, with a high near 85.